School meals are ordered in the classroom at registration by children. 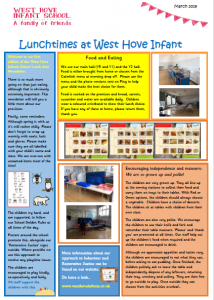 From September 2014 all pupils in Reception, Year 1 and Year 2 have been offered a free school meal.The menus are on a three week rota and are based on nutritionally balanced home cooked meals. They contain lots of fruit, vegetables and salads to help boost children’s intake of essential vitamins and minerals. The levels of fat, salt and sugar are also reduced. Alternatively, you can provide your own nutritional cold lunch. If you will be providing your child with a lunch, please do not include items that contain nuts or seeds, as a number of children in the school have serious allergies to them. 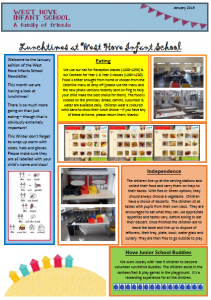 You can find the latest menu for school dinners here. Visit Cool Milk to order school milk for your child. If your child is under five they are eligible for free milk but this must still be ordered.